Product Description Oil content or solvent extractables in wax can affect key properties such as strength, hardness, melting point, etc. The sample is dissolved in methyl-ethyl ketone or a 50-50 mixture of methyl-ethyl ketone and toluene, cooled to precipitate the wax, and filtered. The oil content or solvent extractables content of the filtrate is then determined by evaporating the solvent and weighing the residue. 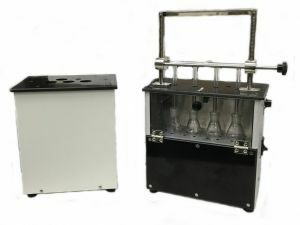 The K17600 Oil-Solvent Extractables Content Apparatus determines oil content or solvent extractables content in petroleum waxes in accordance with ASTM specifications. Includes Filter Stick Assembly; Cooling Bath; Air Pressure Regulator; and Evaporation Cabinet. Filter Stick and Assembly - Filters petroleum wax samples per ASTM specifications. Consists of 10mm diameter sintered glass filter stick with air pressure inlet tube and delivery nozzle, and a 25x170mm test tube. Inserts in Cooling Bath. Cooling Bath* - Accommodates three (3) 25x170mm test tubes for cooling samples and filter stick assemblies. Insulated stainless steel tank with finished steel exterior. Removable composition top plate has thermometer port, filling port and three 25.4mm (1") test tube ports. Fill tank with suitable cooling mixture. *A mechanically refrigerated cooling bath is available. Please contact Koehler's Customer Service Department for information. Air Pressure Regulator - Controls air flow to the filter stick assembly at the required rate. Mercury bubbler-type, with 250mL glass cylinder, T-tube and rubber stopper. Evaporation Cabinet - Thermostatically heated cabinet evaporates solvent from filtrate per specifications. Accommodates four weighing bottles. Delivers air stream vertically downward into bottles through glass jets. Manifold assembly is adjustable for positioning of jets at the correct height above the sample surface. Controls temperature at 35 ±1°C (95 ±2°F). Finished steel cabinet with composition front plate and hinged glass door.